AS we welcome in the month of June the Wombats enter the final month they have yet to experience. In its first three days they experienced chilly temperatures, uncomfortable heat and humidity, and their first real thunderstorm. We should witness a bit more of this summer though there will be less viewings of the Olympics at 3:00 AM. 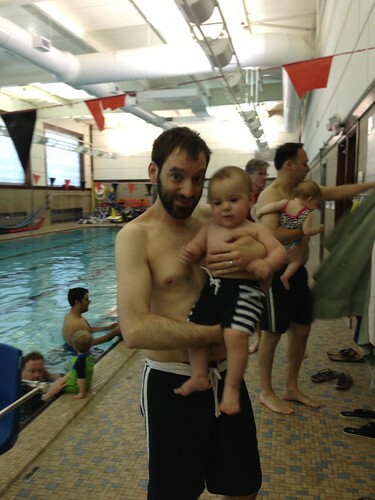 On Saturday we took the guys to yet another swim class. The class is almost over but it has been a smashing success. The guys can't wait to get in the pool and often throw themselves over the side into the water as we catch them. 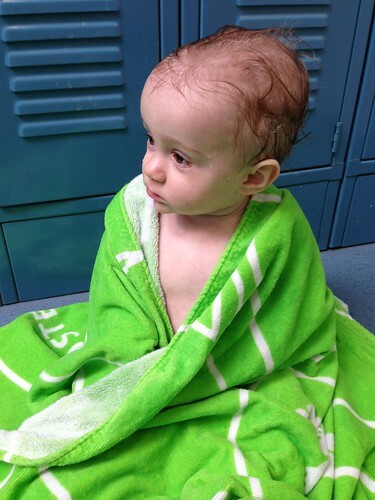 The class has been successful in that it has completely eliminated any fear of water. However, it completely eliminated any fear of water. I'm not so sure that's a good thing. After swim class Jen made them their first scrambled eggs which, despite the comical picture of Elliott, went over quite well. 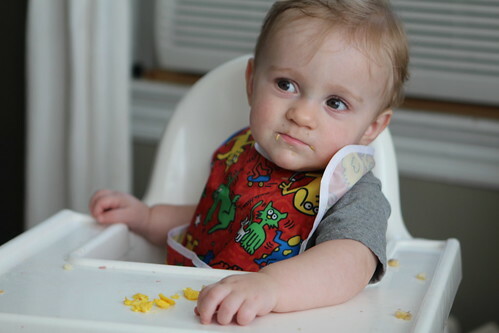 Then, after a particularly busy morning, Martin actually fell asleep in his high chair, something that has never happened before. 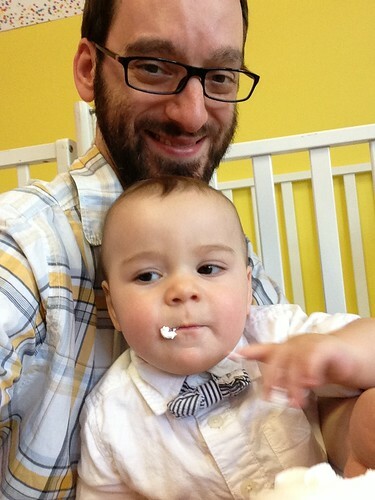 After a brief nap we took them to day care where they were doing a graduation ceremony for all the bigger kids. They also got to have cupcakes. 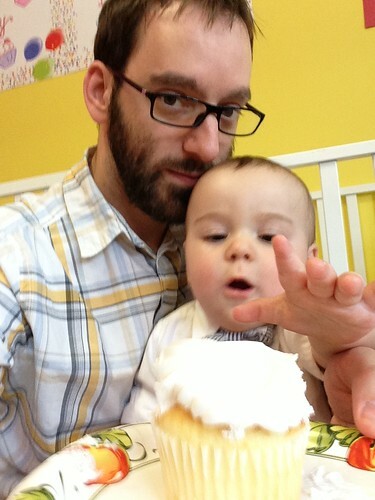 I tried to take a picture of Elliott with his cupcake but it didn't go exactly as I'd planned. I worked late on Saturday and Jen had to get the guys ready for bed. I found this picture on her phone which seems to show Elliott making a break for it while Martin applauds him. I got home around midnight and decided to have a beer before bed. 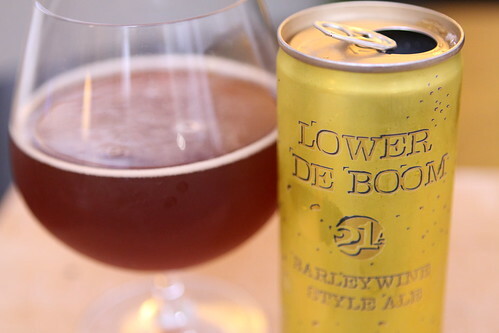 I figured I'd have this Lower De Boom Barleywine from 21st Amendment Brewery since it was only 8.4 ounces. 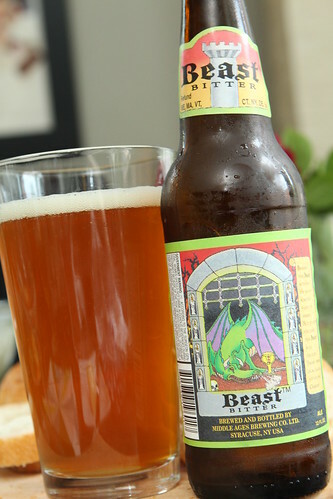 However, at 11.5% ABV those 8.4 ounces packed a surprising punch. This was a nice barleywine if you're into that sort of thing. 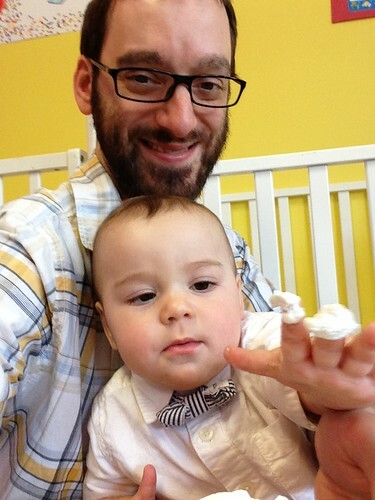 Sunday morning we got a visit from our friends Danielle and Eliyanna and their twin sons: Hugo and Leo. After meeting them at the train and taking them all to the farmer's market they were tired and we put them down for a nap. Not wanting to upset the delicate nap we let Elliott sleep with his hat on and a giant, soggy Mum-Mum crumb on his shirt. That's just Parenting 101 right there. 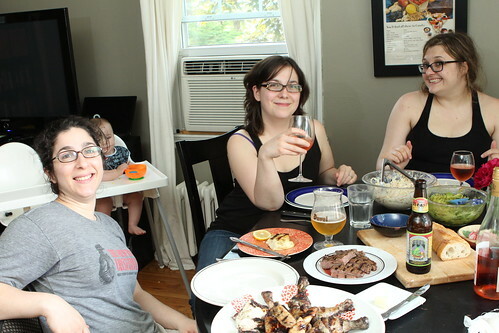 We had a late lunch/early dinner barbecue once we got some sort of temporary balance with the babies. 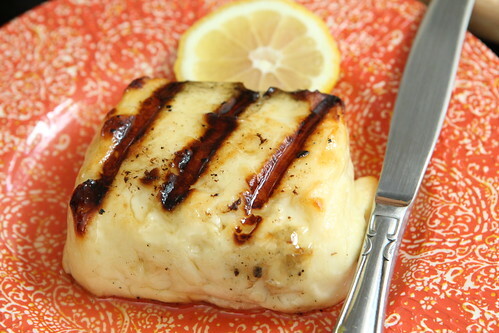 I grilled up a nice fat chunk of haloumi and drizzled it with lemon juice and honey. 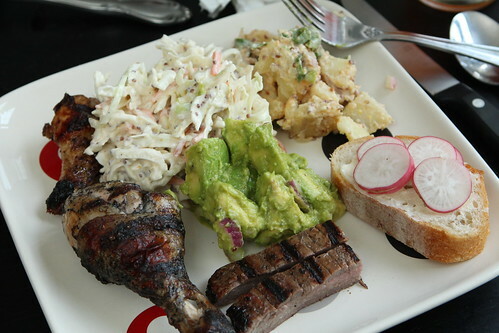 I also grilled marinated steak and chicken, made coleslaw, potato salad, and avocado salad with lime, red onion, salt, and pepper. 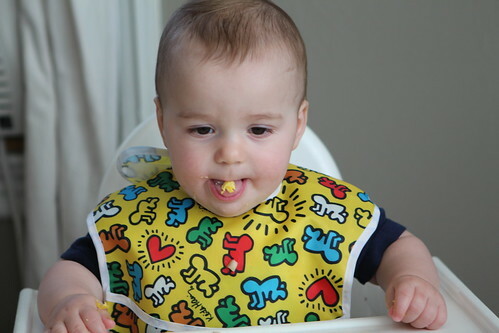 As everyone took shifts holding babies and eating it caused for some twin mixups in the high chairs. 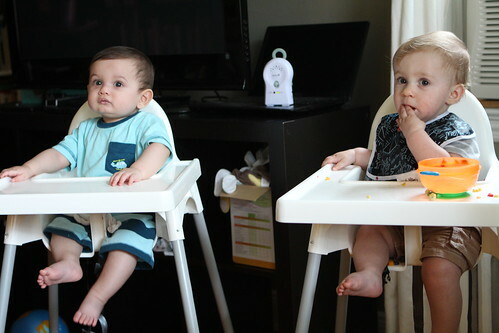 This didn't seem to faze Hugo or Leo but Martin and Elliott seemed a little confused as to why the baby in the other high chair was suddenly different. We gave the Wombats their first ever taste of lamb which went over far better than I would have anticipated. Also better than I anticipated: this Beast Bitter from Middle Ages Brewing Company in Syracuse, NY. It reminded me of something I'd see on Blog of Holding if Paul did beer reviews. We had an elaborate plan to walk to the Tiki Bar after our guests headed out for the day. However, since this is an hour round trip to walk we elected to drive instead since we were putting off our parental duties of cleaning and getting the Wombats ready for day care in the morning. 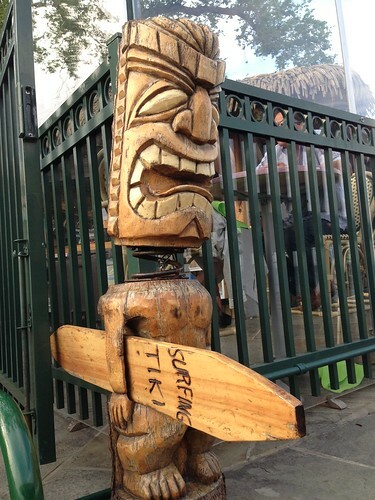 The guys had an amazing time at the Tiki Bar, mostly just yelling, banging on the table, and being amused by things that are not inherently funny. Jen had a margarita and I ordered a Captain Lawrence IPA. Whatever they brought me was most certainly not the Captain Lawrence IPA or any IPA for that matter. It was, however, beer, so I enjoyed it. I wished I'd kept the menu so I could have tried to figure out what I actually got. We also took them to the pier to view the damage done by Hurricane Sandy last October. They hadn't been there since a month before the hurricane in September of 2012 when we pushed them to their very limits in an attempt to get some good family pictures. 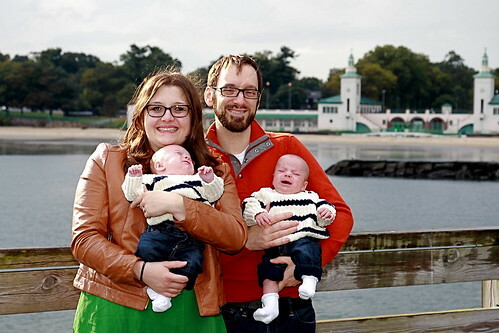 The end result was some good family pictures with two very displeased babies. 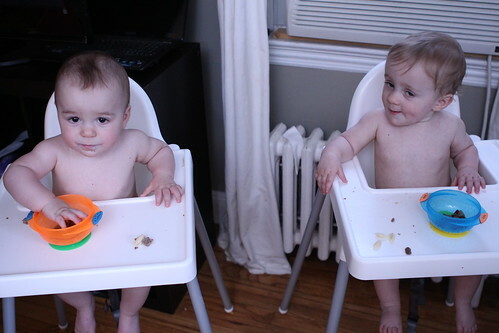 When we got home we gave the guys their first grapes. The only thing they didn't like about grapes is that they had to wait their entire lives to eat them. 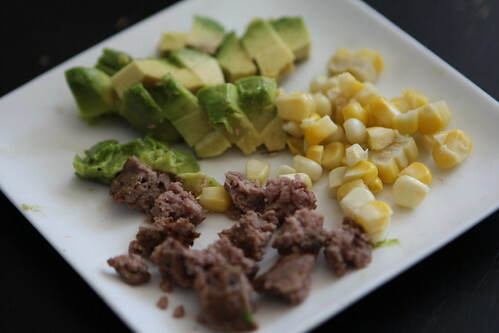 You can really measure the success of a new food based on how much of it you have to clean up off the floor. There were very few grape pieces that needed to be swept up. They seemed to look at us as if to ask why we waited so long to introduce them to the best food ever. Martin absolutely refused to go to sleep. As a special "reward" for him staying up late I brushed his teeth for the first time. 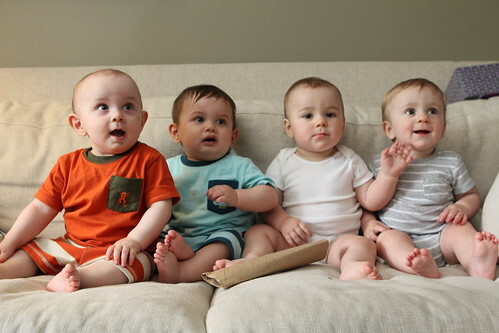 All four of them. A couple of months ago the doctor told us we should start wiping their teeth off at night with a wet towel. Being the great parents we are we did nothing for the next two months and only just started to actually brush their teeth. The thing is that the thing that usually gets them to bed is giving them a small bottle. 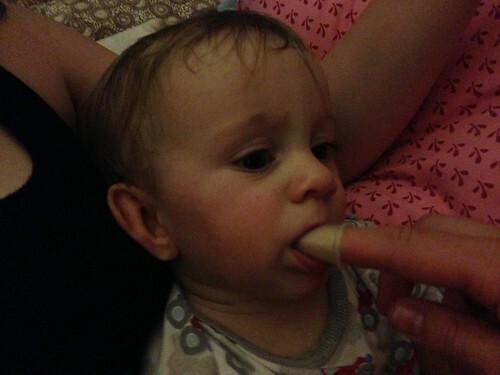 The last thing you want to do, after a bedtime wrestling match, is wake them up by sticking a toothbrush in their mouth. I think we have made the decision that our children's tooth decay is an acceptable price to pay for getting them to sleep.